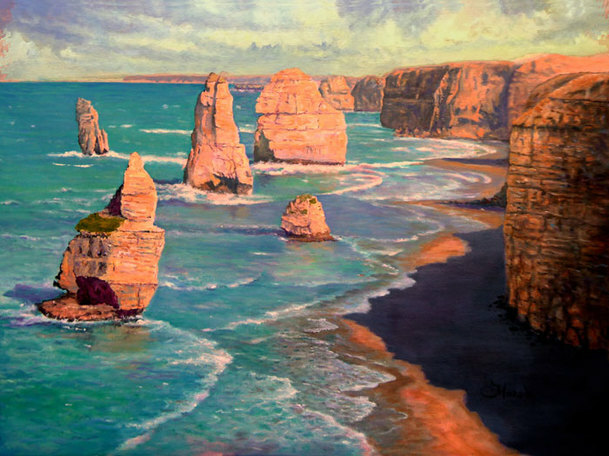 The 12 Apostles are a well know rock formation & landmark on the great ocean road in southern Victoria. The road runs from just west of Melbourne to near the South Australian Border. This painting came from a trip driving the "long way" from Sydney to Adelaide. The trip takes a while but the scenery makes it very worthwhile. In July 2005 the front "Apostle" collapsed into the sea. I have driven this road many times and painted it once before. The light in this painting shows the unique glow in the cliffs.